A Tet cultural space was set up in Dien Tho palace on the site of Hue’s ancient citadel on January 29, attracting many local and foreign tourists. 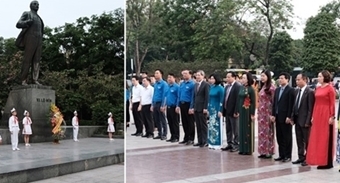 On Jan. 29, the Hue Monuments Conservation Centre relived the Tet pole ceremony that used to take place under the Nguyen Dynasty (1802-1945) to signal that Lunar New Year day preparations can begin. Artisans made Banh Chung (square glutinous rice cake) and Banh Tet (round glutinous rice cake) to celebrate the Lunar New Year (Tet) festival. The event is part of the “Huong xua banh Tet” (Old atmosphere of Tet traditional cakes) programme. According to local authority, the Hue ancient citadel relic complex – a UNESCO World Cultural Heritage site – will be open with free admission for domestic visitors during the first three days of the 2019 Lunar New Year (February 5-7).